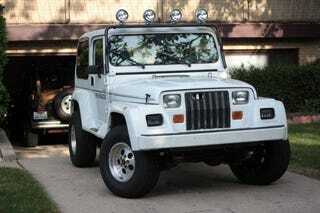 This rarity in Postal White is a 1993 Jeep Wrangler YJ Renegade. As the seller points out several times in his posting, the Renegade is different than a regular Wrangler. At the risk of exaggeration, he posts (and I quote), "Renegade is a heavily dressed up jeep with a 'LOOK AT ME!' chick-turner attitude." This particular example has the 4.0L I6 mated to an automatic, with a 2.5" Rough Country lift and 31" tires. The vehicle's stated to have 213k miles on it. In addition to the light bar with four 100W lamps, it has a CD player and trailer hitch. Also, the seller is including a spare set of Renegade body work in black. It only has the hard top. The wheels are original equipment for the Renegade package. A quick check to Wikipedia confirms the YJ Renegade package was only available from 1991-1994, and was a $4,266 option. The hard top was an additional $1,087 ($923 for the top, $164 for the mandatory rear defroster), and this particular example also seems to have the unpopular column shift option for the slushbox. The asking price for this limited edition ride is $7900 OBO. Does this Jeep make you want to release your inner Reno Raines, or do you want to rebel against it? Put your vote in the comments! Original Craigslist posting here, Wikipedia page on the Renegade here.